The final Itinerary is now up for the tour starting a week tomorrow. All the dates on the flyer are confirmed and there is a possibility of one more being added on the Saturday 8th afternoon. Please follow me on twitter @ghostsosilver , where I will give regular updates (including if we get stuck in traffic etc!). 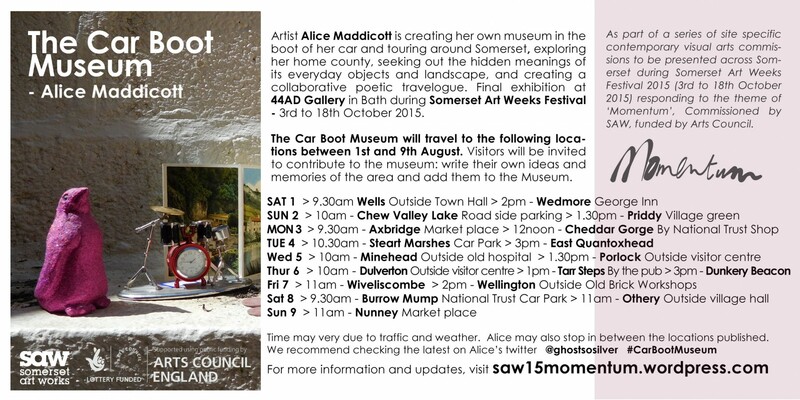 I will also be regularly blogging for Somerset Art Works on their Momentum open call blog – if you click on Alice Maddicott you will get all the posts relevant to The Car Boot Museum – preparatory thoughts, and once we get going I hope the blog will become an integral part of the project – functioning as an archive and digital version of the museum. Read more at saw15momentum.wordpress.com – there is also information about the other artists commissioned for this project.